As we all know that our Facebook Ads cost should be low enough to generate high profit. You can check your Ads performance in Facebook Ads Manager. What important thing you need to check at Ads Manager is cost per engagement for each post. Cost per engagement should be less than 0.003. If it is over 0.003, your ads is not working well or in other meaning, your ads is expensive. In order to get cost per engagement less than 0.003, you have to do several things. Make your quiz more attractive. 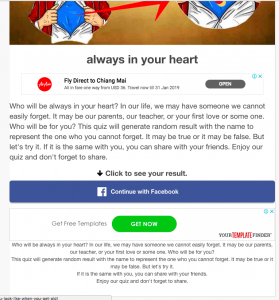 Attractive quizzes can get more engagement from users which can lower cost per engagement. Design your OG image professional look which will also attractive users to interactive with your quiz. Write long description for each quizzes. This is based on my experience. I tried to increase quality of landing page, so I write long description for each and every quizzes. It not only improve the quality of landing page, it also affect on cost per engagement of the Facebook Ads. Now all of my ads cost per engagement is lower than 0.002. Hey thanks for a great post again! 1. When you talk about quiz description, u mean write in on the quiz page itself or somewhere also on Facebook? Like in the ad description? 2. Can you make a post stage by stage how make an ads campaign and which settings to use (budget settings and setup settings in general).. thank you! Re: Description: write on your quiz page. You can also write on your Facebook, but it is not compulsory. Important thing is to write on your quiz page. How many ads are you using per quiz page? are you using native in-feed ads too? Do you have any idea which one of them performs better (in-feed ads vs display ads) ? Hi, I just use News Feeds ads (both desktop and mobile) only. Sorry you misunderstood me. I’m talking about adsense ads to monetize your website! How many ads are you using per page? ( to monetize your website) have you tried native ads too? I only use two ads per page. And I haven’t tried native ads on viral site. The more ads you put on your page, the less RPM you will get. Yup shouldnt take risk on money site.. let me see if above idea helps decrease cost per result.